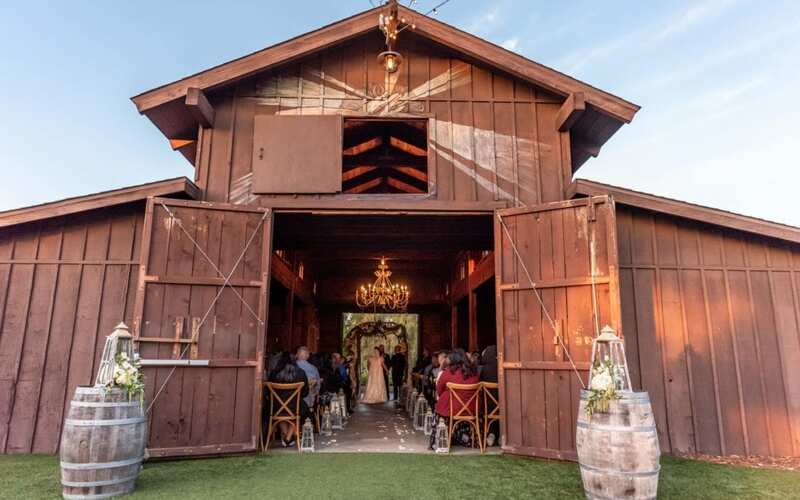 There is something so nostalgic and romantic about a wedding ceremony in the barn at Ethereal at California Botanical Gardens. 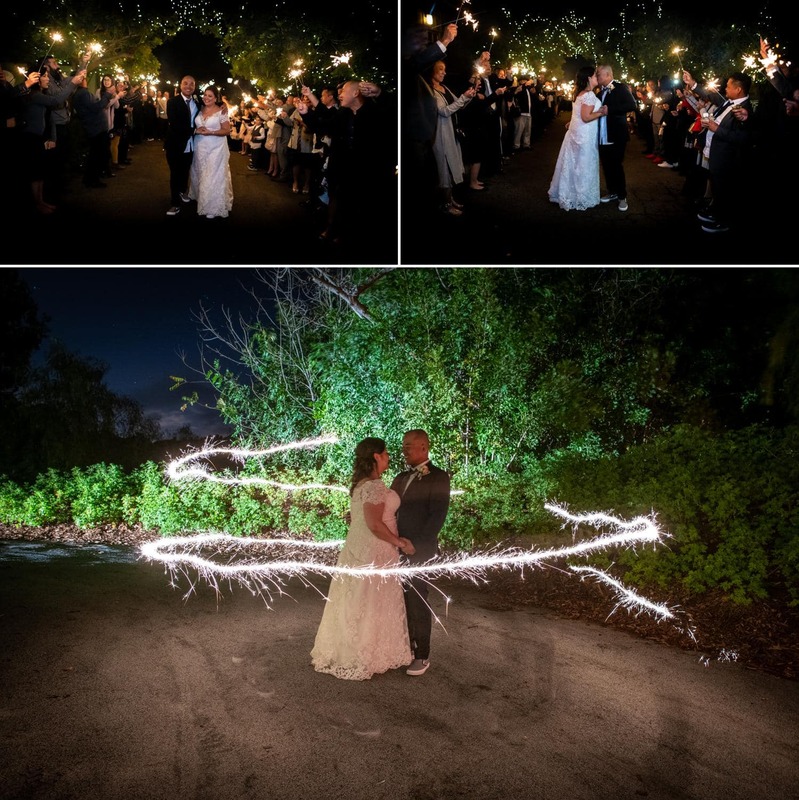 As wedding photographers it just makes our hearts do somersaults. The aged wooden beams no longer touch. Perfectly, imperfect they allow the light to spill through the weathered cracks illuminating the barns hazy interior. The entire atmosphere envelops you in romance. The dimly lit barn emits the softest glow adding to the cozy ambience of the warm wood. 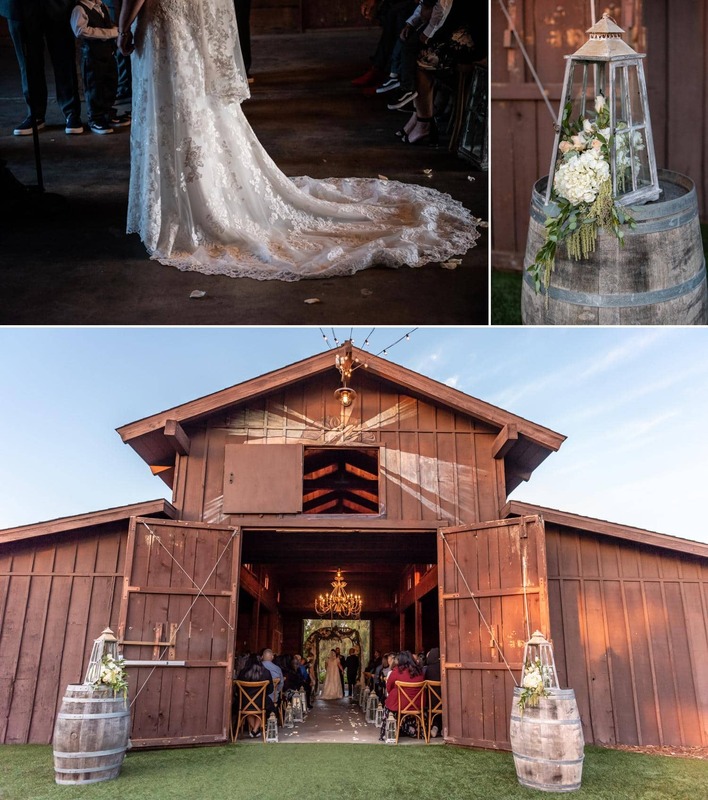 It feels as if the barn has been there forever adding to the timeless feeling of Malia & Geep’s wedding on December 1st, 2018. We first met Malia & Geep for their engagement session and fell in love with their easy-going and fun-loving attitudes. 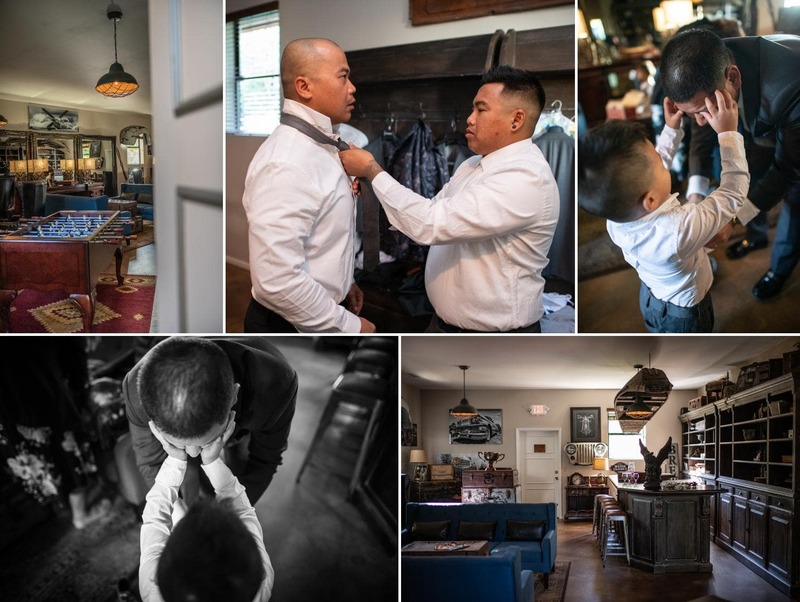 We talked about their first wedding ceremony, a traditional Laotion ceremony in Florida with the groom’s family. 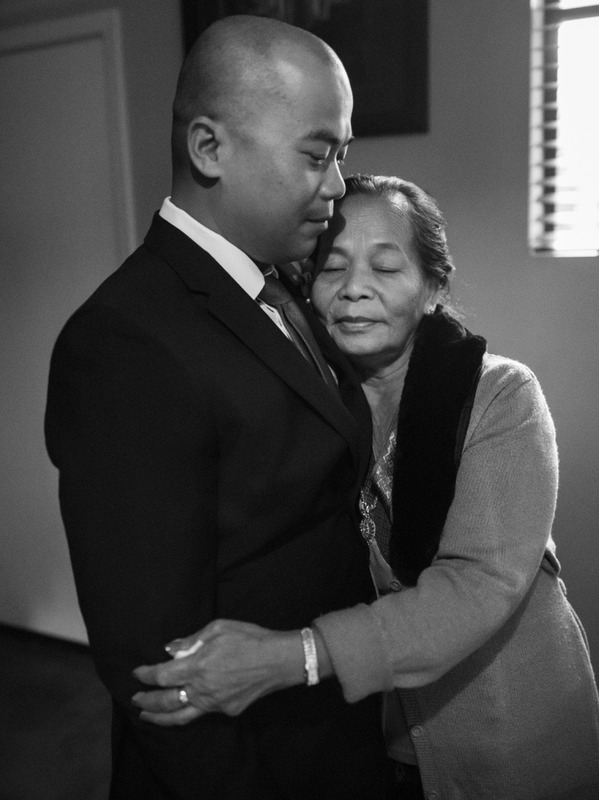 It was the first time the families of the bride and groom had ever met. It was an amazing cultural experience for Malia & her family. But now it was time for a traditional western wedding celebration. 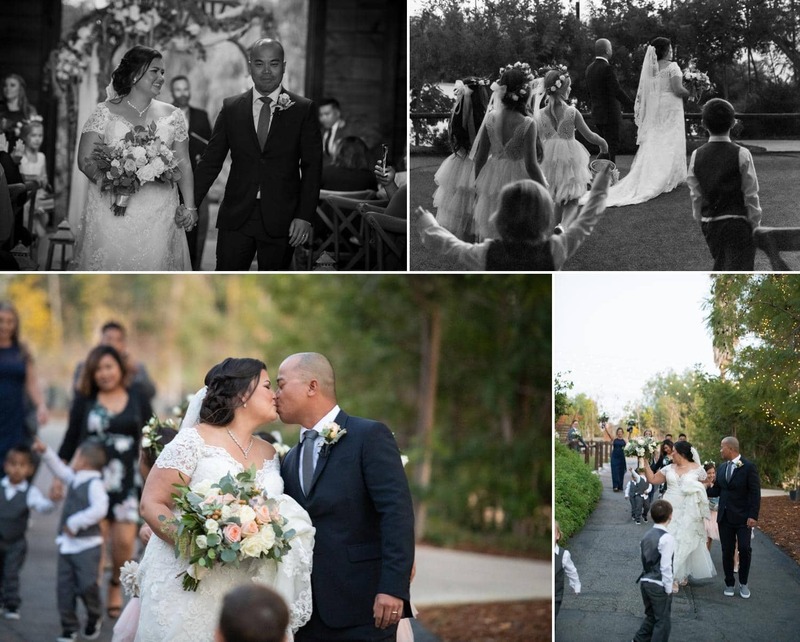 For Malia & Geep California Botanical Gardens was the perfect setting to bring all of their loved ones in for a day of celebrating love. 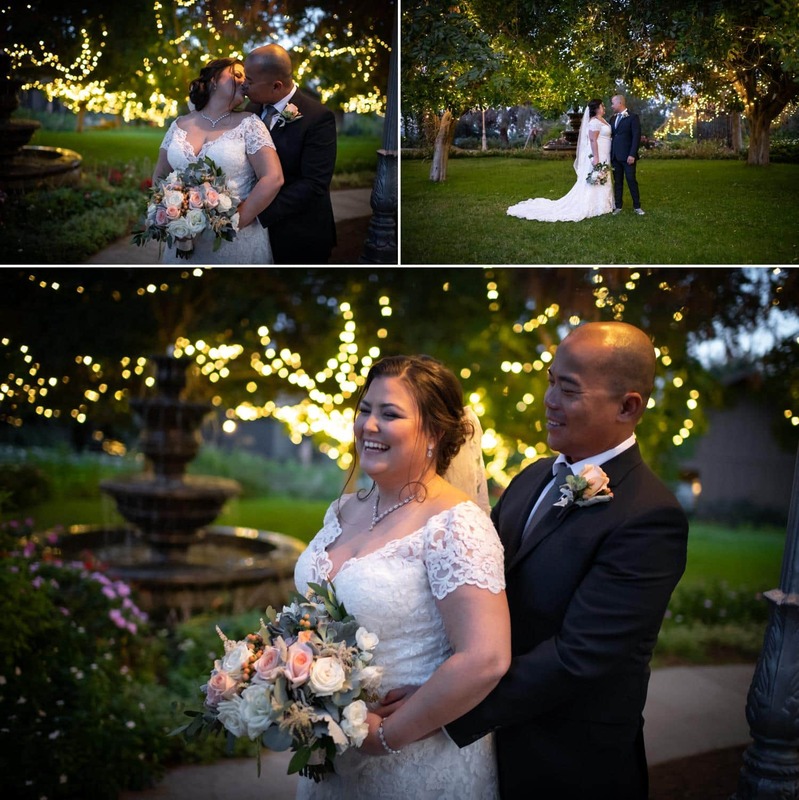 The couple was inspired by the rustic charm and bohemian touches at California Botanical Gardens. 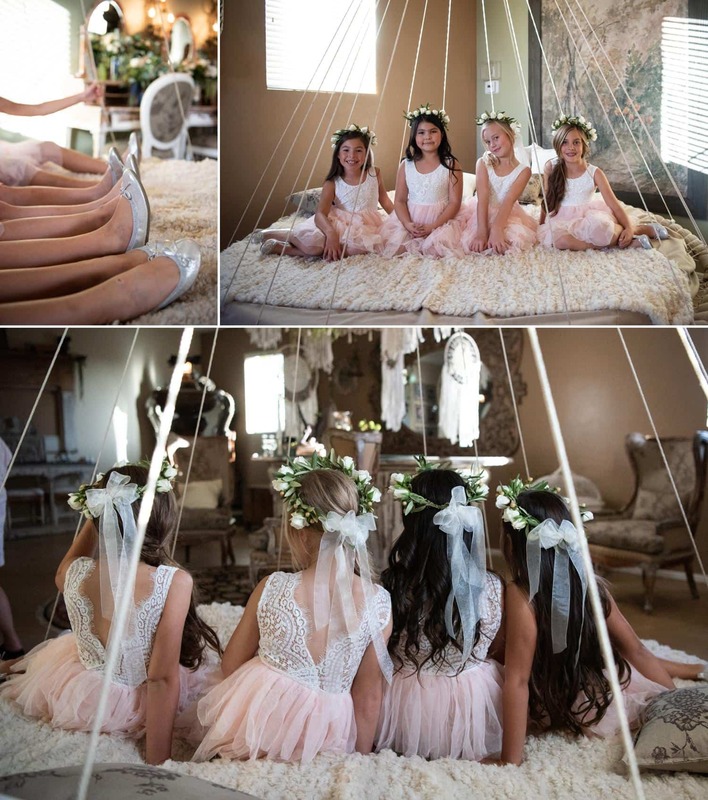 They took the natural surroundings of the wedding venue and infused them into every detail of their day. 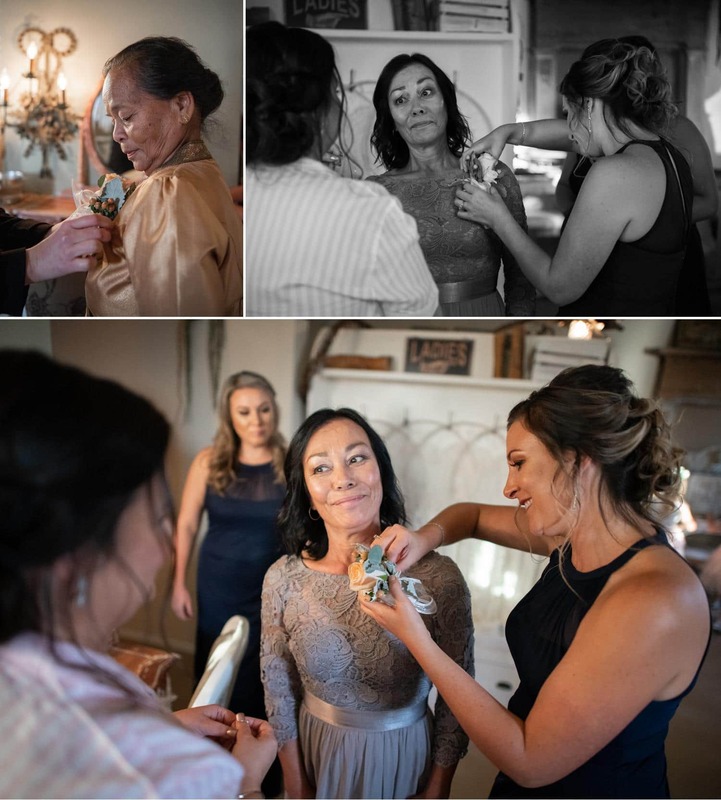 I met Malia for the day at Lawrence Welk Resorts where the girls lounged in their matching pajama sets, hair pinned up in curls and coffee brewing in the background for their bridal party mugs. The scene was calm, dance music playing in the background as a few of the girls curled up in chairs clutching pillows as the curling wand passed through their hair. I unpacked my makeup and my camera bag and got to work. 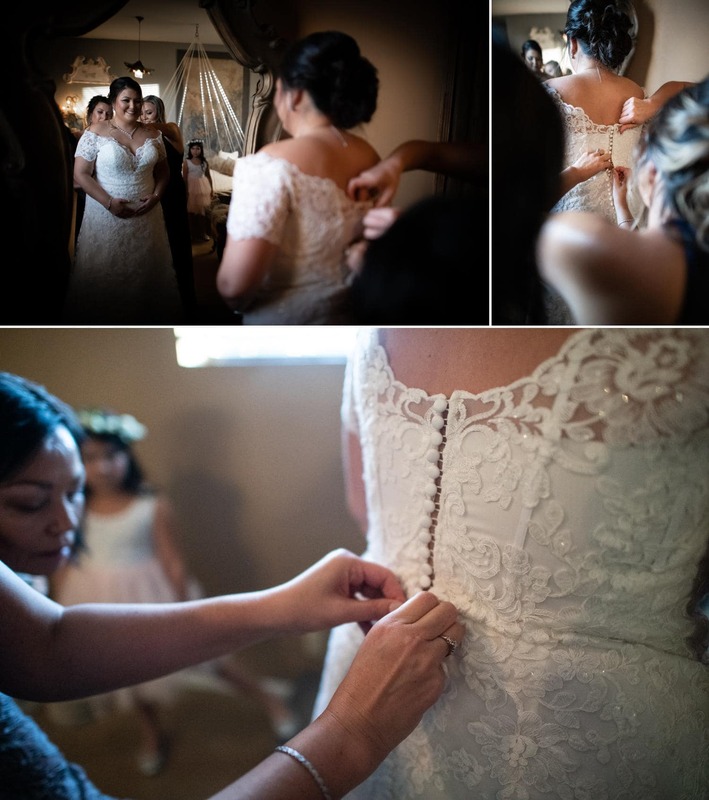 Sweeping eyeshadow across Malia’s eyes as she calmly anticipated her wedding day. 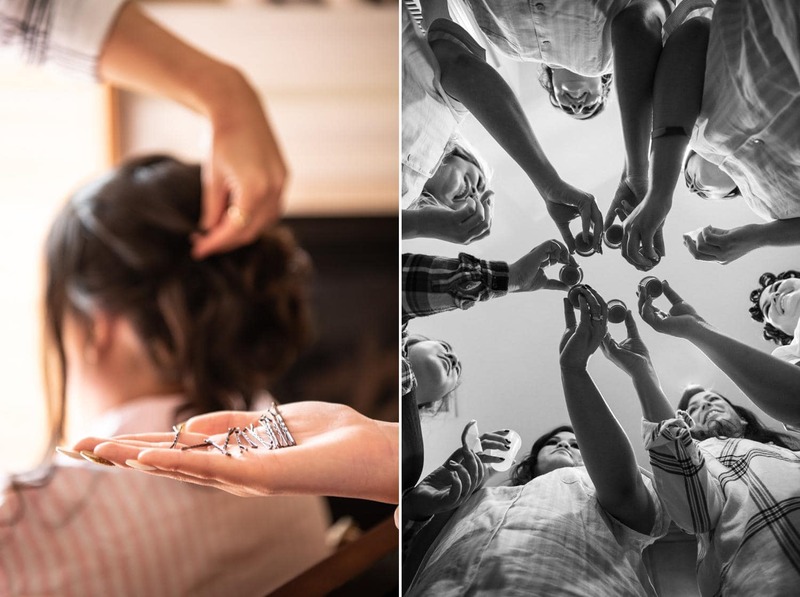 We took a few makeup breaks for some wedding photos of celebratory shots. As soon as the last individual lash went on it was time for Malia’s hair and for me to switch to wedding photography for the day. She sat in a chair in front of the glass door to the balcony. The morning light cascaded around her as her hairstylist Marie pinned, twisted and teased Malia’s hair into a romantic up-do. The twisted bun was kept low and intricate twisted pieces swept their way to the bun, while baby curled tendrils kissed Malia’s cheek as they draped down her face. 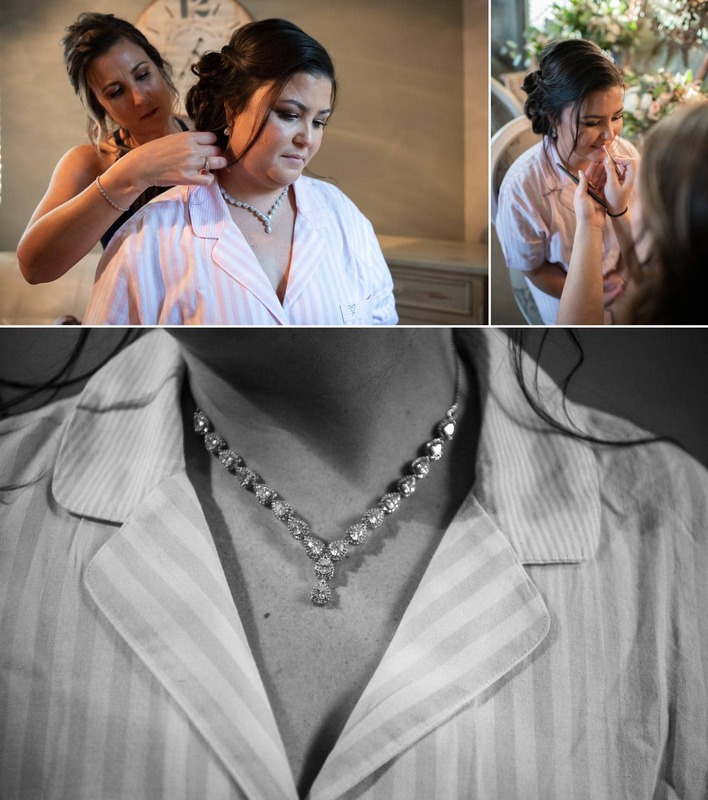 It was the perfect bridal hairstyle to compliment and tie together her entire romantic bridal look. A sleek black party bus that seemed the length of the entire block of villas awaited the bridal party to depart for California Botanical Gardens Wedding Venue. Ryan and Emry Photography Videographer, Adam were already at the wedding venue. Capturing the details of the day when I arrived. 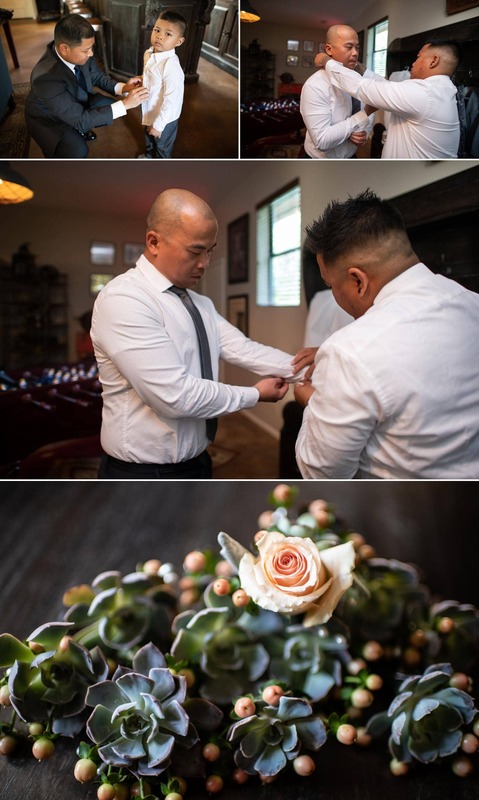 I was obsessing over all of Malia’s wedding styling choices as I hit the shutter capturing the wedding details of her & Geep’s day. 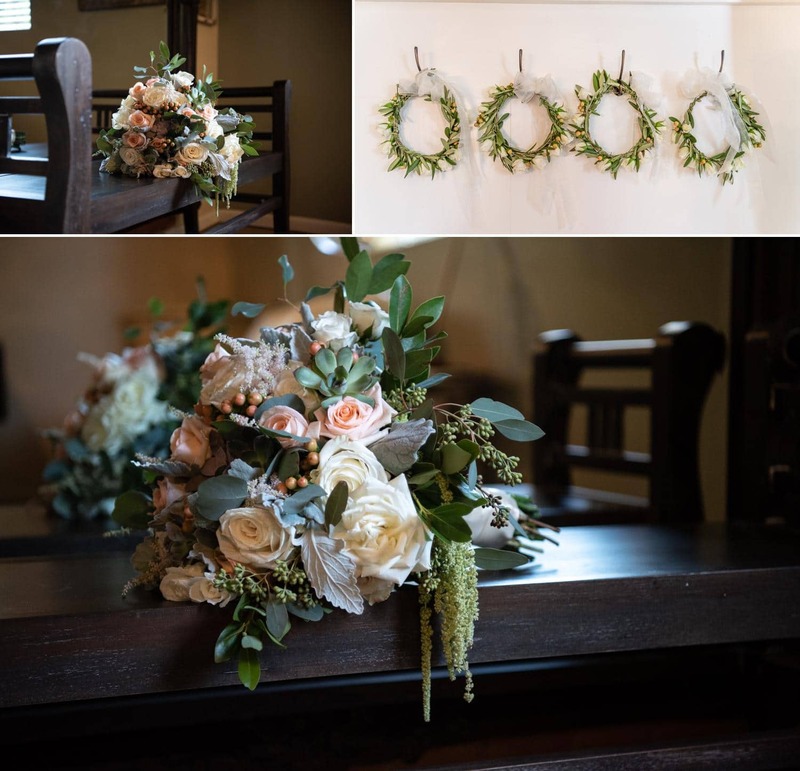 From the sweet bohemian flower crowns for the five flower girls to the organic cascading bridal bouquet with unexpected inclusions of berries and layered textures. Every last detail showed that Malia’s taste is impeccable. 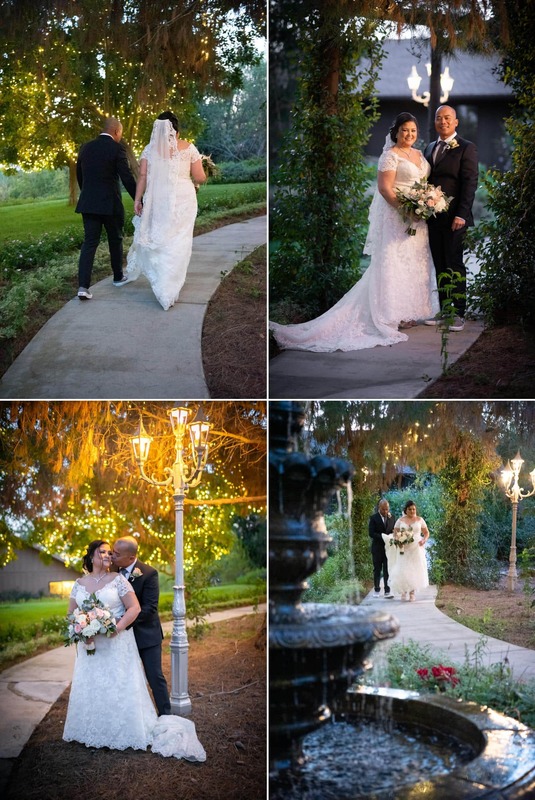 The couple arrived at the wedding venue and sipped champagne and cocktails with their bridal parties in the insane bridal and grooms suites at California Botanical Gardens. 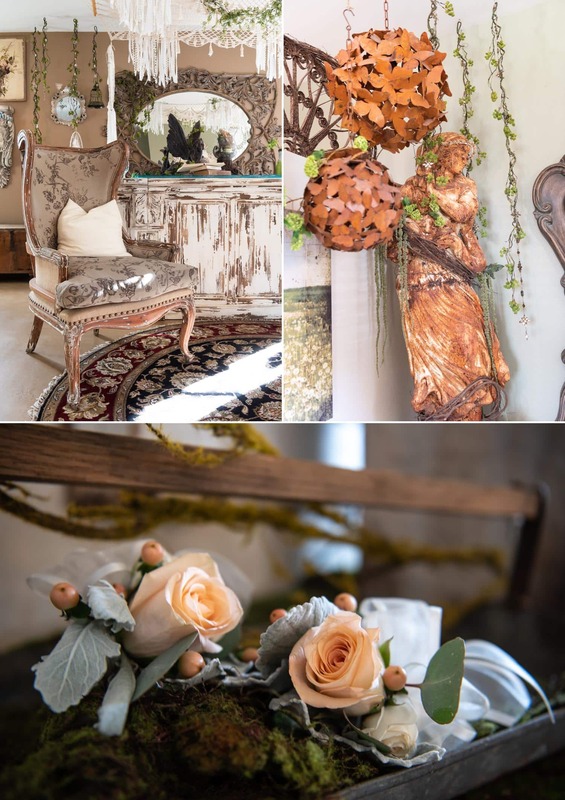 We have said it before and we will say it again- hands down the best bridal and groom suites out there! 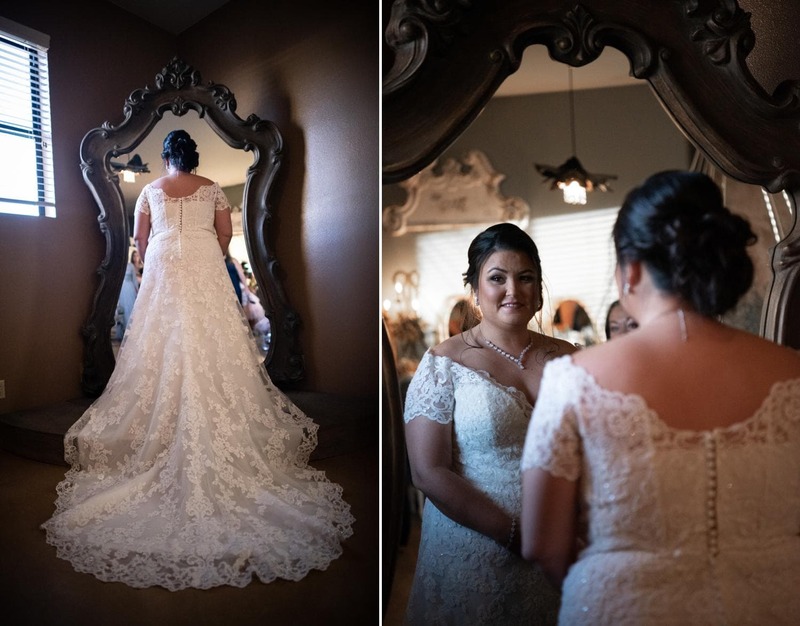 Her mother and sisters helped her get into her lace wedding dress by designer Mori Lee. 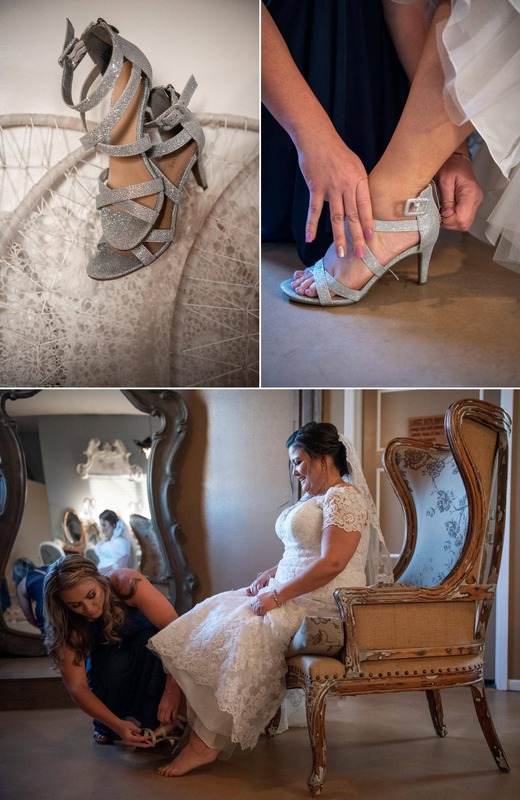 It was the perfect fit for the venue and decor and really brought her entire theme to life. The off the shoulder fit with a sweet heart top emphasized her beautiful necklace. 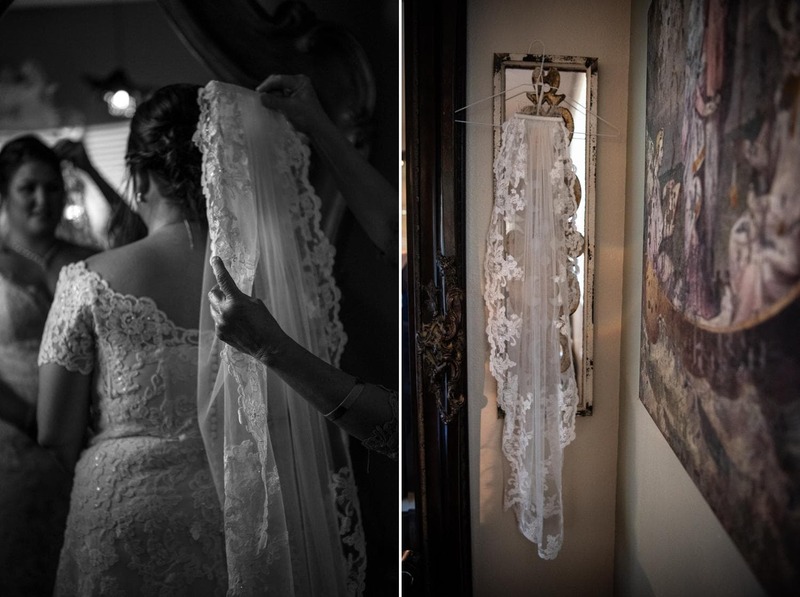 Her bridal veil had delicate lace trim and really accented her entire timeless bridal look. 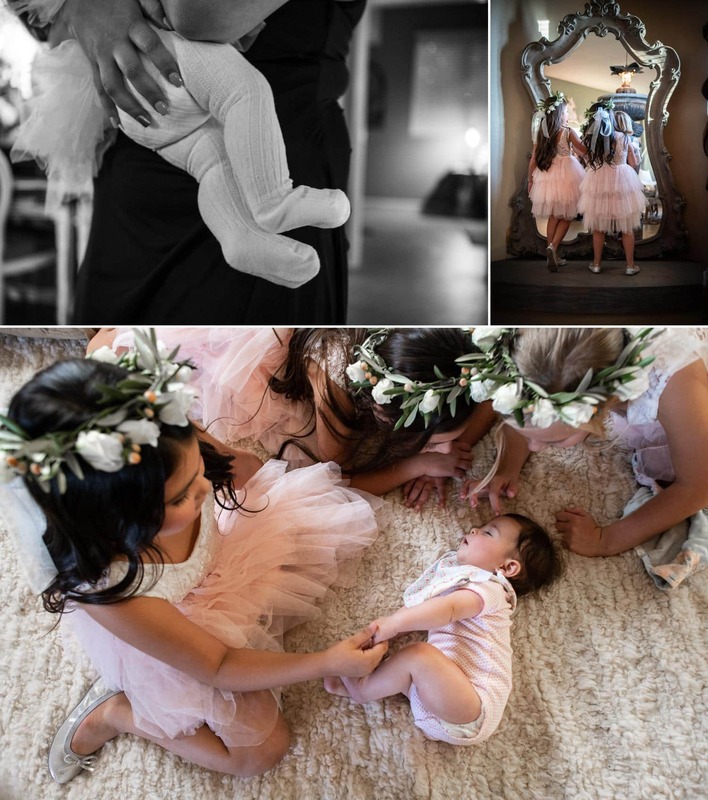 What I love most about Malia’s bridal style is that it will always be relevant, free of trends the photographs wouldn’t place her in a certain era. After months and months of wedding planning it was time to walk down the aisle. The December sun was beginning to set and a slight chill was setting in as Malia linked arms with her father before exiting the bridal suite. 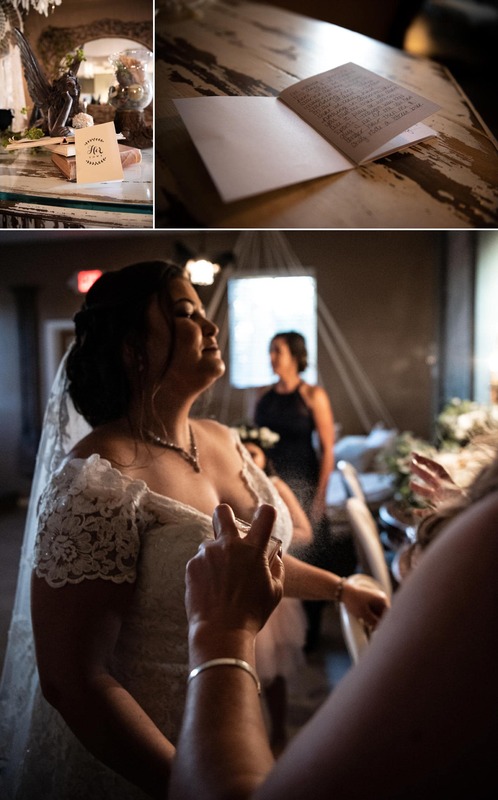 A silver necklace containing her recently lost brothers ashes laid delicately in her bouquet. It was an emotional moment as she laid the heart shaped silver pendant in the heart of a succulent. California Botanical Gardens transforms at night with the vast display of twinkling lights melting over the treetops like wax down a candle. Cascading from branch to branch it becomes a magical sight. We arrived at the barn the doors of the ceremony site. 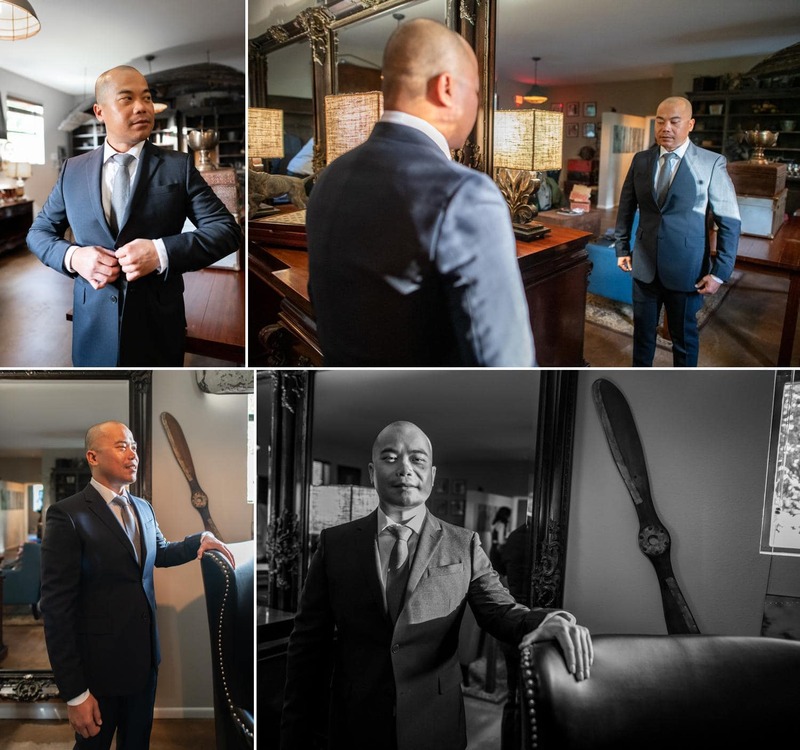 They were closed tight, holding in the emotion of anxiously waiting guests and the groom inside. 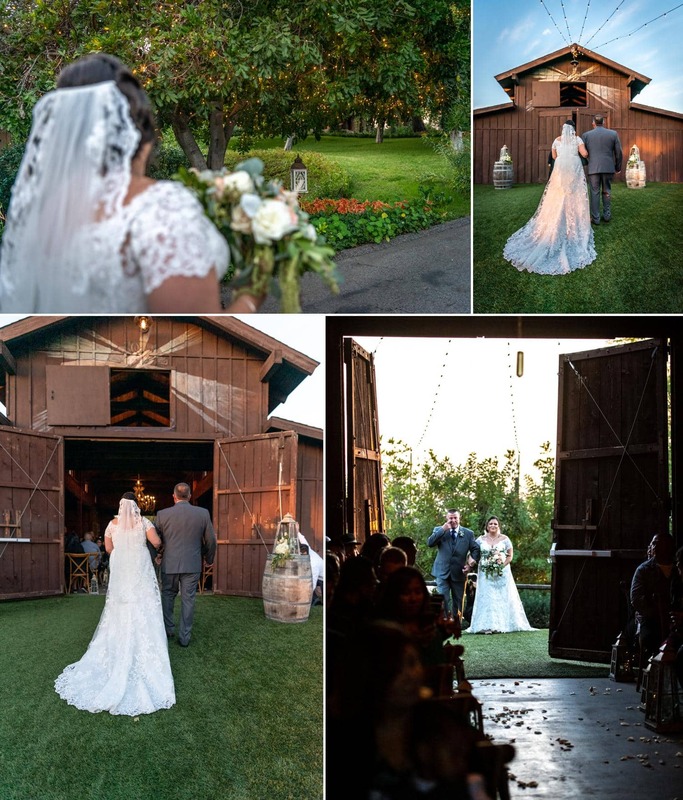 The double door swung open from each side revealing the rose scattered aisle with Geep at the end. 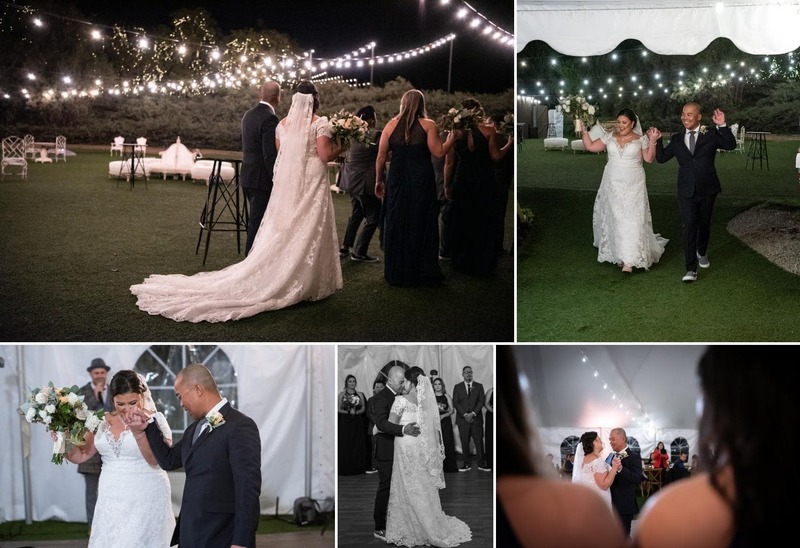 The lace train of Malia’s wedding dress grazed the rose scattered floor. 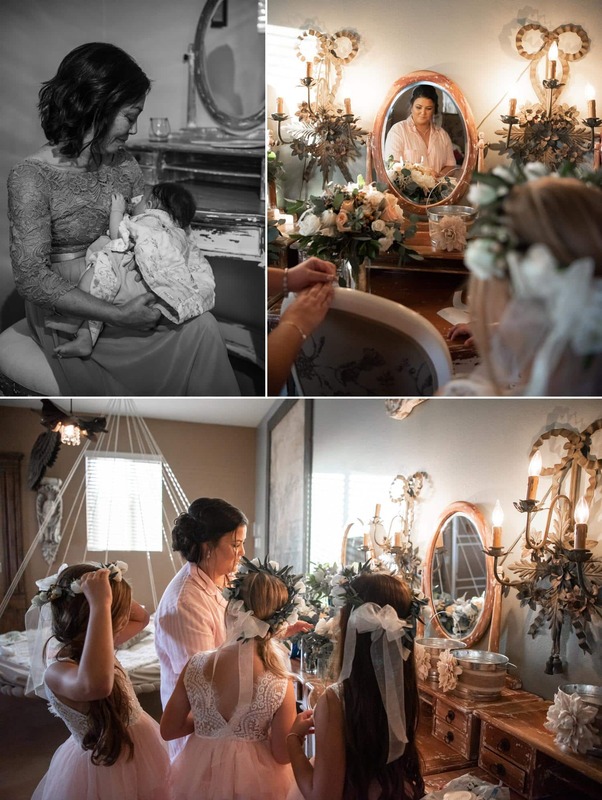 Lanterns lined the chair ends and a rustic wooden arbor with draped linen and garden inspired flowers sheltered the officiant as Malia and her father approached. After kissing Malia her father joined the couple’s hands, sweeping away tears as he took his seat. 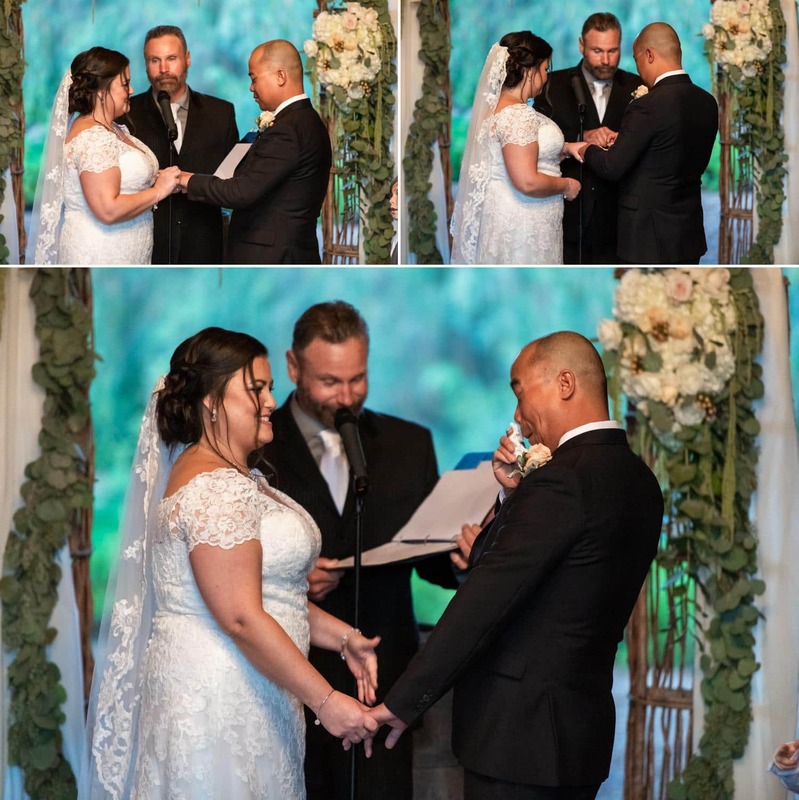 The ceremony was heart felt, the couple choosing to craft their own vows and share them in front of friends and family. 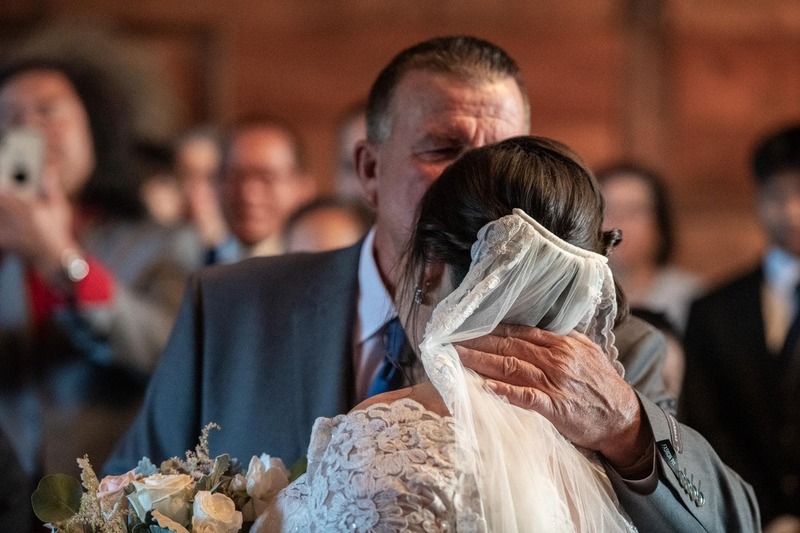 Everyone bowed their heads in prayer, the officiant’s hand was placed on Malia’s shoulder as he led the prayer. The ceremony carried a silence about it, the kind of silence of a winter evening. It was time to seal the deal with a kiss. We love the little ones reaction to the couple’s first kiss, the look of surprise and curiosity. 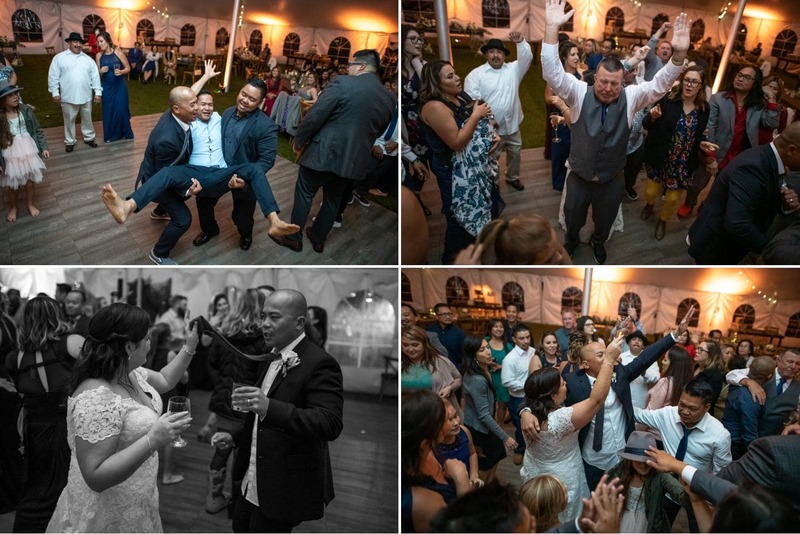 And we’d be remiss if we didn’t mention his adorable celebratory arms in the air as we all exited the intimate barn ceremony. Wedding guests sipped cocktails on the lawn beneath glistening market lights as we took the couple around California Botanical Gardens for a few wedding portraits. 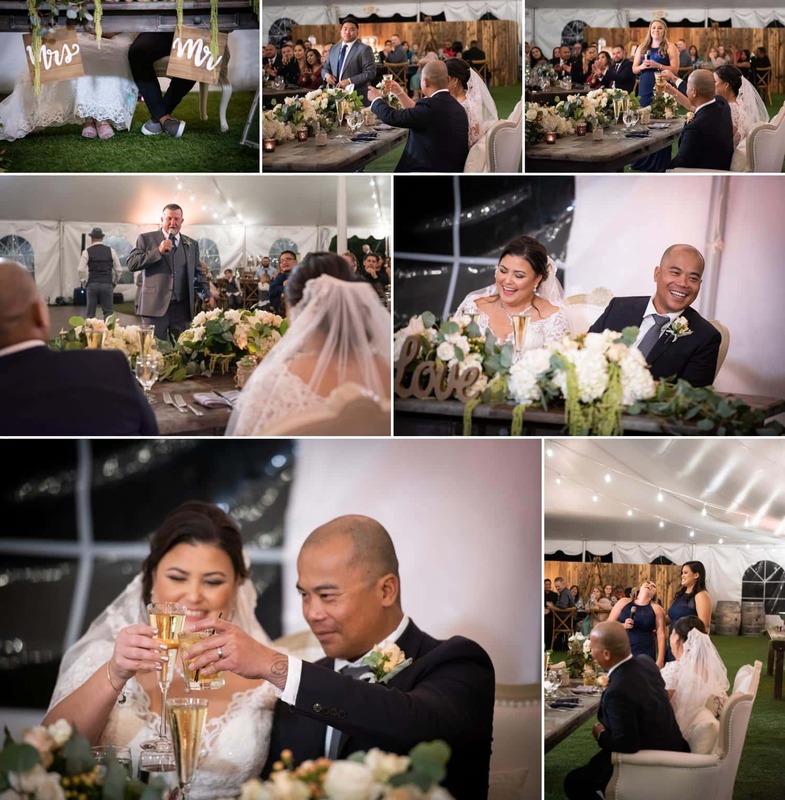 The white tented reception stayed warm despite the December chill in the air. Guests dined on long rustic farm tables. 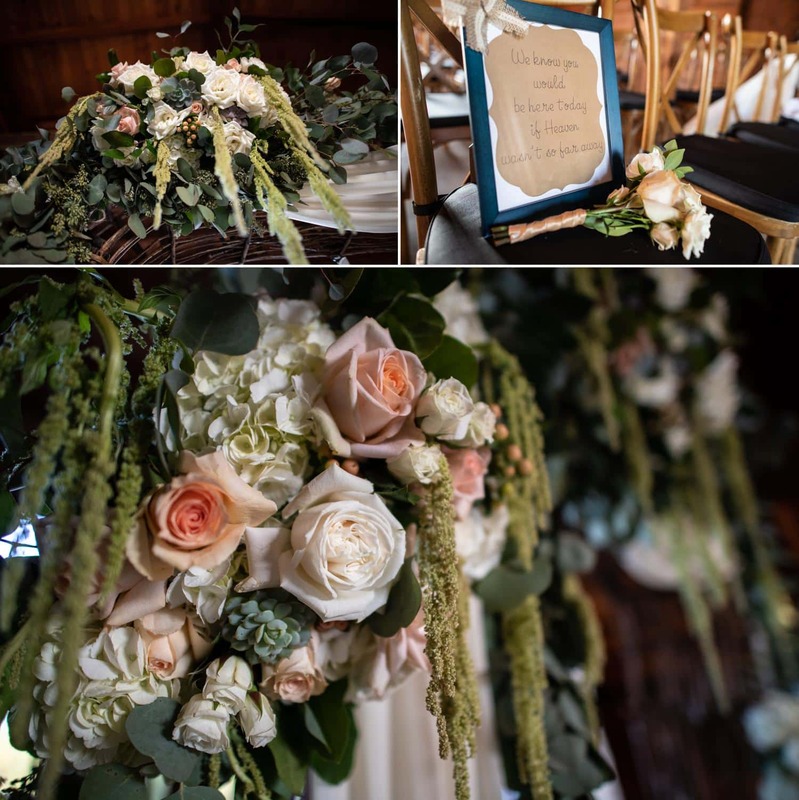 Creamy florals, eucalyptus and gray napkins dressed the reception table. Place settings creatively doubled as favors with succulents in canvas bags calligraphed with guests names on the front. The first dance was tender as the couple- foreheads pressed into one another would have moments of sweetly closing their eyes. Family speeches had everyone laughing before dinner was served. The evening was spent divided among many activities from indulging in the cupcake bar and cake to playing bags on the custom set the couple had created. Laotion music echoed over the valley as the guests embraced two different cultures brought together by one love. Our sincerest gratitude goes out to Malia & Geep for one, letting us in on one of the most intimate days of your lives, and allowing us to witness the beautiful vulnerable moments. 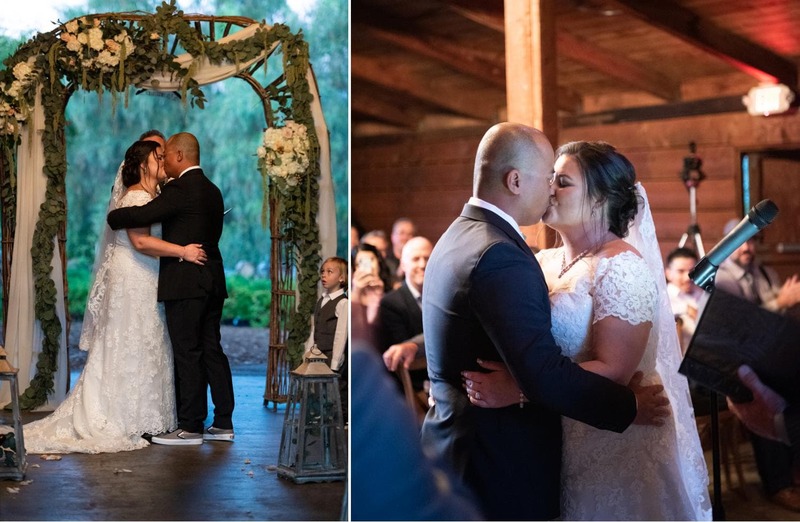 And two, for trusting us to document this day for you, for allowing us to run with the emotions your day made us feel and capture in a way that reflects that. We met through a mutual friend. I worked with his friend and we all decided to go out one night. Our friend was not trying to set us up and that was not the intention when we decided to all hang out. I think that is what makes our relationship work because it just happened naturally. Quickly we learned that we couldn’t be more opposite of each other. We had very little in common. But we were able to share our love for different things with each other and eventually enjoyed some of those things together. We are proof that opposites attract! We spent the first years of our relationship getting to know one another since we had only been friends for a minute before we started dating. We both come from large families but his family lives in Florida. We come from 2 different cultural backgrounds but we both value family. We were both open to new traditions while spending time we each other’s family. 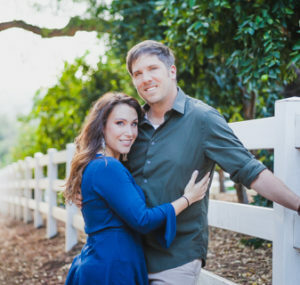 We dated fro 10 years before he finally popped the question!! I was ready and he knew that i was. I didn’t rush him, well until year 9 of our relationship! I respected that it had to be on his time and when he was ready. Well he was finally ready on Christmas of last year! My family usually gets together but that year we were all hit with the holiday bug! Several of us were sick including myself! We decided to give everyone 1 more day to feel better and 1 of my sisters was working on Christmas. So we decided to get together the following day. Geep suggested that we still exchange gifts between us at home just the 2 of us. Honestly since I was not feeling 100% I had little energy but agreed. I went first. It was a large box that he had given me. I sat down and began unwrapping it. Inside were bottles of Champagne. I had no idea what was about to happen. He is good at gift giving and has tricked me before with another gift. I thought he was going to tell me we were going to go on a trip or something. 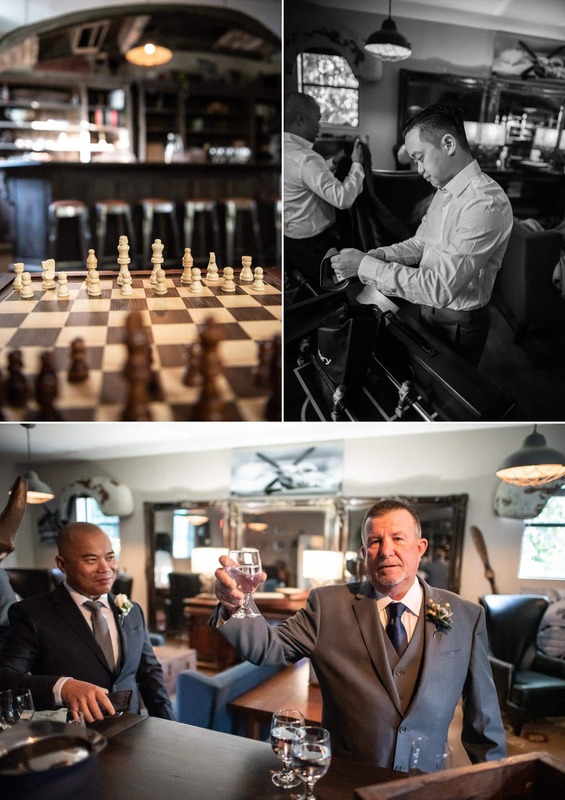 He then sat next to me and told me he thought I could use the champagne to celebrate..still no clue… until he pulled out the ring! I was in shock! Even to the point when he asked I didn’t answer! Then of course I said yes! I couldn’t believe what was happening. Tears came almost 10 mins after being in shock! He told me he chose Christmas because it was my favorite holiday. Immediately we faced timed his family in Florida! I figured he told my family but only my dad knew. He asked his permission ahead of time and dad kept the secret. So I got dressed and we drove to see my mom and sisters so I could tell them all in person. Except the sister at work. We video chatted her!! I couldn’t wait to tell them! And they were all just as shocked as me! We eventually popped 1 bottle of Champagne from my gift box and celebrated on Christmas day!